Als Apple im Jahr 2007 das iPhone vorstellte, revolutionierten die US-Amerikaner um Steve Jobs damit den Markt für Smartphones. Seither gab es kaum ein Smartphone, welches ähnlich großen Einfluss auf die Branche hatte oder ähnlich revolutionär war. Dem in Moskau ansässigen Unternehmen Yota Devices könnte dieses Kunststück vielleicht gelingen. Ein Akku kann eine enorm hohe Kapazität haben, dennoch ist der mit Abstand größte Stromfresser eines Smartphones nach wie vor das Display. Aus diesem Grund forschen Entwickler schon lange an neuen Display-Technologien, um den Stromverbrauch von Smartphone-Displays zu reduzieren. Eine Möglichkeit wäre beispielsweise die eInk-Technologie, die überwiegend in eBook Readern wie dem Amazons Kindle oder Cybook Odyssey HD Frontlight von Thalia. Und eben diese Display-Technik baut das russische Unternehmen Yota Devices auf die Rückseite seines YotaPhone genannten Erstlingswerks. Laut Yota stehen damit jederzeit die Informationen zur Verfügung die der Nutzer auch sehen will, ohne das Gerät dafür extra über die Power-taste einschalten und entsperren zu müssen. Dabei kann der Nutzer zwischen einfachen Nachrichtenfeeds, Feeds aus sozialen Netzwerken wählen aber auch anstehende Termine und so weiter. Mit dem 2.100 mAh großen Akku erreicht das YotaPhone durch das eInk-Display locker Laufzeiten von einem ganzen Tag. Aber auch der Rest der Technik ist gar nicht mal so schlecht. Das YotaPhone ist übrigens das erste Produkt von Yota Devices, einem Ableger des russischen Modem/Router-Herstellers Yota. Das YotaPhone selbst ist vermutlich seit gut 2 Jahren in der Entwicklung und bringt neben dem zweiten Display auf eInk-Basis noch eine weitere Besonderheit mit sich. Denn die Taste zum Ein- und Ausschalten fungiert zugleich als SIM-Karten-Slot. Erwartet wird das Smartphone frühestens für das vierte Quartal 2013, weitere Informationen zum „Archetyp der Smartphone“ sollen zum Mobile World Congress 2013 in Barcelona Ende Februar bekannt gegeben werden. Moscow, Russia. 12 December 2012. A new archetype in smartphones with two displays will help consumers enjoy life’s virtual side without missing the real one, explains the phone’s creator, Moscow-based Yota Devices. YotaPhone is a powerful Android-based phone. It is the first time a smartphone integrates a full-color LCD on one side and an electronic paper display (EPD) on the other side. The two displays are linked together to open a new world of unlimited user experiences. The EPD is the user’s personal space for receiving notifications, linking to social media, reading news as it happens or simply displaying favorite pictures. The LCD and EPD are both 4.3 inches. “Today if you want to check your email, calendar or social media page, you have to pick up your phone, turn it on, open the application and only then can you receive the information. With YotaPhone, this information will appear on the electronic paper display effortlessly, continuously and updated in real time,” Martynov explained. The two displays have different functions and different purposes. YotaPhone lets users watch videos, play games and perform other functions best suited on the LCD, but adds an electronic paper display for content that requires longer reading time, like reading a book or magazine. It also keeps important information visible without draining the battery. Boarding passes, maps, tickets and other important information are displayed even if the battery dies. “Technology is setting the tone of our lives rather than the other way around. We at Yota Devices aim to rebalance the relationship with our smartphone. YotaPhone takes all the best components of this great lifestyle product and amplifies them. At the same time, we address some of the ways smartphones interfere with us being truly social beings. YotaPhone is always connected, but in a smarter, less stressful way,” said Martynov. Yota Devices has been working on YotaPhone for more than two years. The first model was shown to then Russian President Dmitry Medvedev in September 2010 at a meeting on the country’s modernization program. 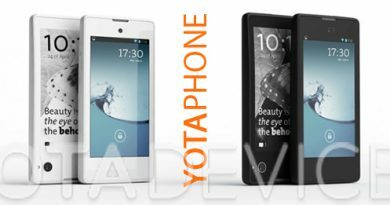 Yota Devices has filed a number of patents, copyrights and design rights associated with YotaPhone. YotaPhone uses the Qualcomm Snapdragon MSM 8960 platform, one of the most advanced processors integrated into a single chip, and the latest release of the Google Android operating system. The API developed by Yota Devices will allow the developer community to create innovative ways to use and benefit from the phone’s two displays. Yota Devices has created a number of applications for YotaPhone to allow users to take full advantage of the EPD. “YotaPhone is elegant, slim and sleek. It’s as gorgeous outside as it is inside, featuring two Corning Gorilla Glass screens, which are exceptionally resistant to damage,” Martynov said. This is the first time Corning’s 3D Gorilla Glass is being used on a smartphone. YotaPhone will be available for sale worldwide in the second half of 2013. It is a multi-band, LTE phone that will work anywhere in the world. Exciting new details about YotaPhone and its innovations will be unveiled at Mobile World Congress in Barcelona on 25-28 February 2013. Das richtig Revolutionäre am YotaPhone ist dessen zweites auf der Rückseite des Gerätes befindliche eInk-Display. In einem ersten HandsOn-Video wird dessen Funktionsweise genauer erklärt. Übrigens kann nicht jede beliebige App auf das eInk-Display gepackt werden, dazu ist vielmehr die Nutzung des von Yota bereitgestellten SDK notwendig. Ebenfalls nicht ganz uninteressant: Der Verzicht auf kapazitive und Software-Tasten. Stattdessen beherbergt das noch als YotaPhone bezeichnete Smartphone ein Feld für Fingergesten zur Steuerung. Damit dürfte das Smartphone des russischen Konzerns Yota definitiv zu einem der kommenden Highlights des MWC 2013 werden.